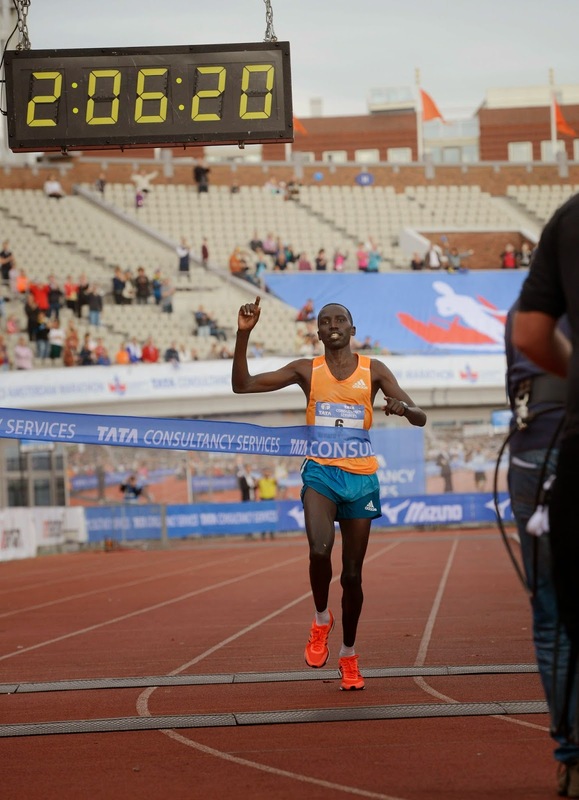 The 39th edition of the TCS Amsterdam Marathon was won by Bernard Kipyego in 2.06.22. The 28-year old Kenyan was the best equipped to deal with the difficult weather conditions, and was awarded for his great condition by winning his first major marathon. He was far from the track record of 2.05.36, but he did improve his own personal record. Training buddy Lucas Rotich and John Mwangangi finished in second and third place and also ran faster than ever before (2.07.18 and 2.07.28). Betelhem Moges was the fastest amongst the women, and finished with a time of 2.28.35. Pubblicazione di Runner's World Nederland. Shortly after the start signal, a large group of twenty men took the lead, including favourites Wilson Chebet, Ayele Abshero and Abel Kirui. It became evident almost immediately that the high humidity level, temperature of roughly 18 degrees Celsius, and the sun, would be a spoilsport. The athletes had to work very hard, which resulted in poor times. What's more, they had to deal with a strong wind on the way along the Amstel between the 15 and 20 km mark. The group in the lead reached the halfway mark in 63.40 minutes. Kipyego was the only athlete in the front who ran faster during the second part of the race (62.40), which attested to his outstanding physical condition. In the Vondelpark, after 38 km, he broke away from his fellow countrymen Rotich (24) and Mwangangi (23), and dashed off towards the finish as strong as ever. 'I am ecstatic with my first major win, and although it was very hard, I did enjoy Amsterdam', says Kipyego. Kipyego came to Amsterdam with a personal record of 2.06.29 and improved his own record with seven seconds. The fast Kenyan finished in second place once before, in the Beijing Marathon, and took third place in the Chicago Marathon. The young Rotich and Mwangangi, who won the Dam tot Damloop just last month, were also extremely strong competitors. The Kenyan trio outdid themselves and we must definitely keep an eye on them in the years to come. Threefold winner Wilson Chebet did not reach the finish line, because he did not seem to have the same focus of the previous years. Abel Kirui also played a secondary role and finished in sixth place with a disappointing time of 2.09.21 and indicated after the race to be struggling with Malaria symptoms. Ayele Abshero once again suffered from calf problems and was therefore unable to finish his race. Afterwards, Betelhem Moges was clearly pleased with her win in Amsterdam. However, the 23-year old runner from Ethiopia did not have anything to say to us about her time of 2.28.35. 'It is sad that I could not run a personal record, due to the weather.' She finished in 2.26.42 earlier this year in Dubai. Ogla Kimayo (Kenya, 2.29.15) and Diane Nukuri Johnson (Burundi, 2.29.35) followed close behind her. The race ended dramatically for track record holder Meseret Hailu, who left the race after 30 km. The Dutch championship took place this year during the TCS Amsterdam Marathon. All eyes were on Patrick Stitzinger, but unfortunately he had to leave the race after only 2 km, because of hamstring troubles. He left Amsterdam feeling disappointed. The Dutch marathon title went to Paul Zwama, with a time of 2.21.59. Colin Bekers finished in second place and Imo Muller in third place. Zwama had a difficult race: 'I emptied all water bottles along the way and also suffered a cramp. Eventually I decided to forget about my time and to just focus on my position. The finish in the Olympic Stadium was the most fantastic moment that I ever experienced.' Jacelyne Gruppen won amongst the women, with a time of 2.55.40. 'I came here for my personal record, but was unable to finish with a good time. I lost an excessive amount of moisture, and the last kilometre was really very hard on me', says the new national champion. The TCS Amsterdam Marathon, by IAAF Gold Label, received more participants today in the Olympic Stadium than ever before. An incredible 44,094 runners registered for the various segments (marathon, Mizuno Half Marathon, TCS 8 km and Kids Run). With nearly 16,000 registered marathon runners, the TCS Amsterdam Marathon is the largest marathon in the Netherlands, and is one of the largest European marathons. With 18,500 registrations from abroad, it appears that the TCS Amsterdam Marathon has gained tremendous international popularity. With a record number of 93 nationalities, the ambience in and around the Olympic Stadium was overwhelming.